If I were asked to describe what our fly-in is all about, I might first start out to mention all the aircraft, different makes and models, number of wings, landing gear, etc. This is my normal response to questions about the event and I answer this way because for those who haven’t been, that is all they really want to know. Yet this quietly bothers me. During the past decade, you’ve likely read my thoughts on the fraternity mentality that has invaded aviation. It seemed to arrive in the 90’s and for the longest time I felt its presence took away from aviation. This is why the question of what our fly-in is all about, often worded briefly as “what do you have there,” bothered me so much. With this question, people were first looking for the identifiers of an “A-list” fly-in or “B-list” fly-in and then they were deciding whether or not to attend. I’ll be the first to admit there are places where more intense collections of antiques gather, paved surfaces where more heavy iron can be found, and cold static museum campuses where more high rollers show up to hand out the money in exchange for rewards. I’ve been to every one of these places and they do very little for me. Because of this, not too long ago I realized maybe the fraternity mentality is good for our kind of aviation. Perhaps the narrow minded, glory seeking, Nomex flight suits with flammable tennis shoes wearing warbird types are weeded out because of it. 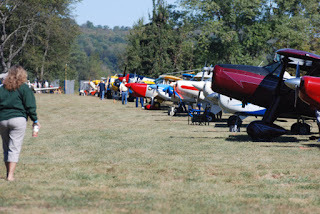 And maybe the stodgy condescending low time spotless vintage aircraft types would go somewhere else because of the common folks here at our event. And hopefully those who believe old airplanes should be parked for eternity would simply know better than to show their faces here. And you know what, I was right. I was recently reading an editorial written by a previous employee of AOPA. In his paragraphs, he lamented the demise of the middle class in aviation, quoted a source for his statistics that I believe to be questionable, and backed it up with anecdotal knowledge from his time at AOPA. And yet, I do not think he knowingly or intentionally misguided anyone with his beliefs. No; in fact, I believe his experience has misguided him. You see, I contend that if anyone spent time working for AOPA, they would come away with the idea the middle class of aviation is disappearing. Have you read AOPA, scanned their emails, or observed the growing number of elite AOPA branches? Yes, I am pretty sure that if you were part of the AOPA culture, you would either be run off or you would fit right in to their culture of $15,000 panels, turbine aircraft, and editorials about civility. And if you fit into this mold, you likely don’t visit Lee Bottom. 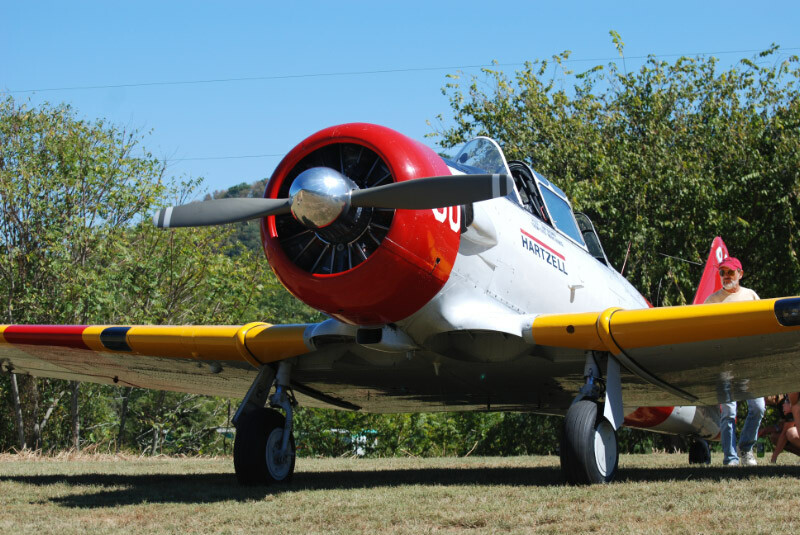 Here at Lee Bottom Flying Field, if a warbird is present, the pilot is likable. If a vintage plane is on hand the owners are approachable. Were an experimental to be sitting here, the owner might try to help you build one yourself. And if someone drives in, then they came to help out. That’s quite simply the kind of people we have here and we’re extremely proud of it. As evidence of this, during the fly-in, a bubbly female volunteer went for her first plane ride. Here's the rest of the story. 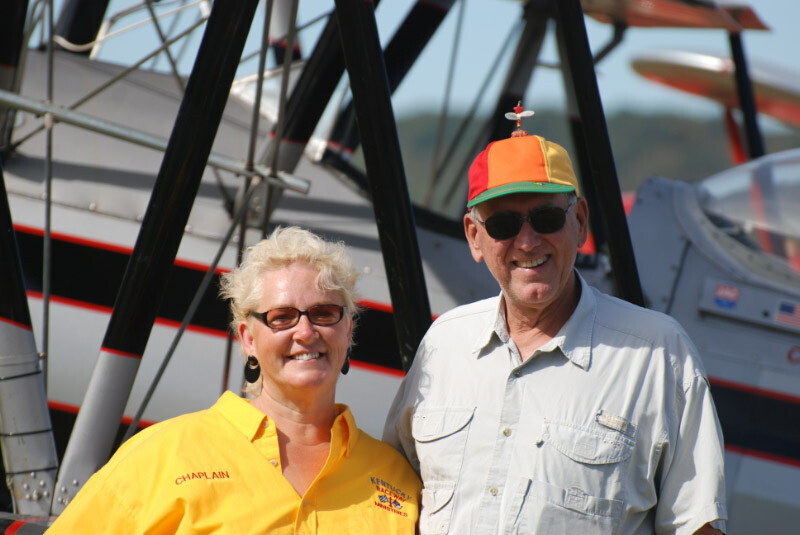 Ken and Terri Bittner have been coming to our fly-in for many years. Every year they insist on helping. 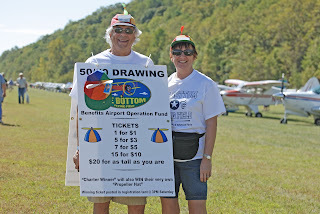 Then a few years back they suggested they could do a 50/50 drawing during the event to help raise money for the airport. When we said yes, they went all out. Ken made a two sided sign he could wear over his shoulders, he and Terri put on beanie caps with propellers, and they went around the airport twisting arms with their wonderful personalities. The winner would get the usual 50% and a colorful propellerized beanie cap just like the ones they were wearing. When the drawing was held on Saturday, a friend of ours from Florida held the winning ticket. Jim Jarvis is an attorney that gives attorneys a good name. Simply put, it’s hard not to like his never ending desire to get a little more fun out of life. Therefore, when he won, all his friends offered to let him buy drinks. Jim had other ideas. After winning, Jim did something special with his new found bucks. 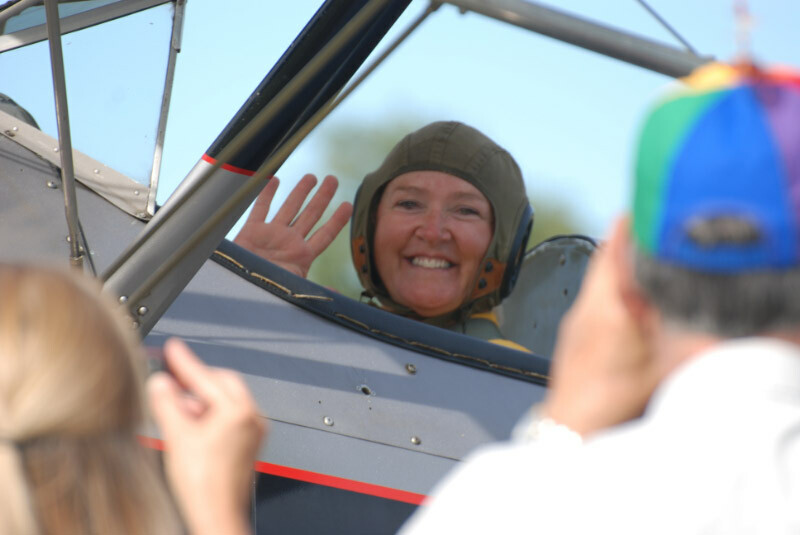 He took part of the money and bought Jackie, one of our volunteers possessing an infectious personality, her first ride in a biplane. 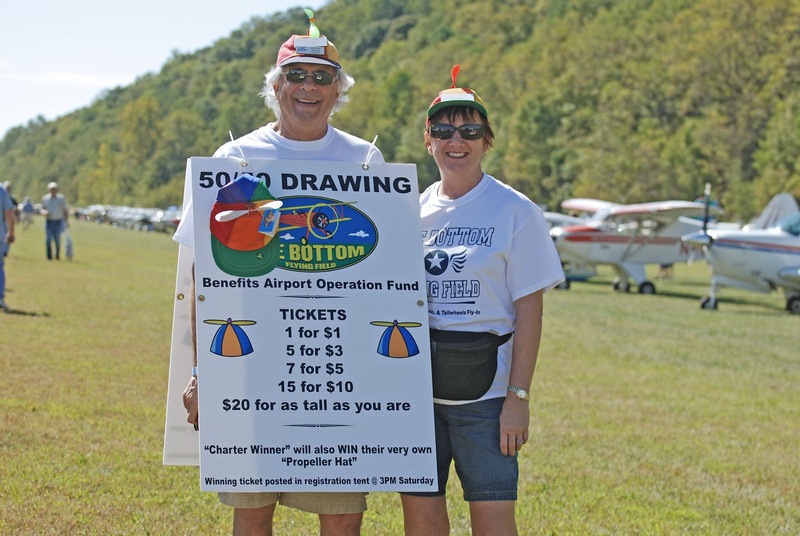 He then took what was left over and donated it back to the airport fund raising drawer, thus creating the defining moment of last year’s fly-in. Enjoy yourself, share the fun, support the airport. After the only rain-out ever, one year before, our event came back strong to offer something special. And in doing so, it attracted the best bunch of people you could ever hope to have in your back yard. Among them are firefighters, plumbers, ship-builders, electricians, doctors, machinists, airline pilots, restaurant employees, small business owners, teachers, lawyers, truck drivers, bankers, you name it, they are represented. The real people of aviation haven’t disappeared, they’ve merely quit going where they aren't welcome so they can go where they are. You folks are the best! I can't speak for the former AOPA employee whom you mentioned, but I spent 5 years there and have seen every facet of the organization. There is a cross section of pilots and non-pilots at Frederick like every other large organization. One of the aspects that people don't see about the people there is that they are concerned with getting money to keep the organization going so we don't have to raise the rent so to speak. One of the largest contributers to the overall cash flow is advertising money to the magazine from new products. AOPA Pilot Magazine is one of the largest aviation periodicals in the world and is a high dollar production. A large portion of the whole second floor is just Magazine. That's all they know, that's all they see. To them, that's what flying is all about. They're primarily magazine people. Unfortunately there isn't a lot of money in the middle class with 50 year old Cessnas and 190B radios. I lamented what I saw as the lack of attention and concern given the average guy, at a time when I was flying a 1942 Airknocker to work. There is the mindset there that the future is million dollar price tags and turbine engines and glass cockpits. However, there are a large number of average middle class aviators there as well. Most of us didn't get paid enough to own the shiny new composite wings. Most of us were flying old Cessnas with 190Bs like the rest of the middle class. You just don't see a lot of magazine space devoted to us. The organization is still one of the best GA support sources around and will continue to be. The reason a good portion of the people there don't see the middle class is because the don't spend a lot of time there and with the average aircraft owner. Now I'm retired and flying a newer high dollar airplane, a 1944 L-4. I'm moving up in the world. Would love to get out there once to see you guys. I, too, have experienced some of the culture of the elite at AOPA but I truly belive that if not for them with an assist from EAA, our flying priveledges would be severely curtailed, if not extinct. I have pilot friends in England, Italy and Australia, and they cannot believe the freedoms we have and the (comparatively) low prices. There are innumberable airports that are open to this day because of AOPA's support. I don't see how AOPA being who they are in any way diminishes what Lee Bottom represents. Both have their place. Instead of disparaging them, mostly we owe them a debt of gratitude. It cannot be much fun to spend your time trying to convince politicians and bureaucrats to preserve our planes and our airspace, but I am damn glad someone is there to do it. They will continue to get my dues money even after I can no longer fly. I agree whole-heartedly with Scott's comment: "I don't see how AOPA being who they are in any way diminishes what Lee Bottom represents. Both have their place. Instead of disparaging them, mostly we owe them a debt of gratitude. It cannot be much fun to spend your time trying to convince politicians and bureaucrats to preserve our planes and our airspace, but I am damn glad someone is there to do it." See the first comment for perspective. I believe that if you protect the bottom rung of aviation, you provide protection for the rest by default. But if your protection only goes to those who can buy new $300,000 planes, then you are leaving the true aviation, the free aviation, the aviation the way it was meant to be out in the cold to fend for itself. That is what AOPA is doing. You speak of AOPA the way most do, as if they are a house of cards and you're afraid is someone questions their efforts it will all come tumbling down. Well, you aren't far from the truth. Just like so many other things, AOPA has reached the point 90% of its effort goes to AOPA life support, not the causes near and dear to the hearts of its long time members. AOPA needs a reboot, a reality check, and some people who are there for the little guy. Right now, there are no signs of either. AOPA may have done great things in the past, you are correct. But show me some good win for aviation they can actually claim rightful ownership to in the past five years? Hey Rich, I did see the first comment. And, in it was this quote, "The organization is still one of the best GA support sources around and will continue to be." I realize you have a different opinion of AOPA, so to help me understand your stance, I would love to see some specifics. I don't follow what they do that closely, but just assume that by sheer weight of membership, they can put some weight behind protecting GA interests. I have, more than once, been involved in their email campaigns to members of Congress to stop the move toward user fees. Again, it is only an assumption, but I would think you would be in favor of AOPA taking up that cause. You wrote: This is why the question of what our fly-in is all about, often worded briefly as “what do you have there,” bothered me so much. With this question, people were first looking for the identifiers of an “A-list” fly-in or “B-list” fly-in and then they were deciding whether or not to attend. Rather than A-list or B list, maybe those folks are just trying to decide whether the event sounds like something they'd like to attend. Someone who likes antiques might be drawn to an event that will have some interesting examples there, while having no interest whatsoever in whether the Thunderbirds will perform. Others might feel the opposite. Still others may be looking for a lot of exhibitor/vendors. Still others may be looking to network. The list goes on. I for one have a limited amount of time and money to spend on my aviation hobby so I want to know something about what will be at a particular fly-in before I commit to it. Whether or not I attend will be based on my judgment of whether it's worth my time, not the organizer's. That's an interesting opinion, but only an opinion. What aviation was "meant to be" depends on your perspective. When I was flying in the military I looked on GA with disdain. After all, they were amateurs at best and money-grubbing feather merchants at worst. The real and pure flying was in the military with a mission, flag, and country on the line! Now I am in GA myself and my perspective is different. Looking up from your grass strip you see aviation one way, others see it another. It's much more complex than your simple assertion. The last two comments are great. They both prove my point. The first one mentions all the shows that would be considered, by most, "A list" shows. Thunderbirds, vendors, antiques are the focus. Maybe it is the fact I actually labeled them that bothers people. You are no worse a person for liking A list shows and you should not be ashamed. People who like A list shows are typically very focused on the aircraft; specific types or from specific groups. B listers on the other hand are typically people who have an overall love for aviation and their choices are usually made around the people that will be there, not the objects. A-listers will stop to watch an airshow every time. B-listers rarely look up for airshows because they are talking aviation to someone. Everyone might want to believe they are B-listers but that just isn't the case. And my point was that people chose their own groups and in doing so they filter themselves. We no longer care that people ask what we have here because we know when we answer their question, if they are A-listers, they will automatically go somewhere else. This way we aren't bothered, on the day of the fly-in, with silly statements such as "there's not much to see here" while 400 plus aircraft are taking off and landing around them. "Some people like Ferraris, some like the automotice industry." The last comment is even beter though as it offers a straight up example of someone who had the "A-list" mentality. Quote "I looked on GA with disdain. After all, they were amateurs at best and money-grubbing feather merchants at worst. The real and pure flying was in the military with a mission, flag, and country on the line!" But now you see more yet you say I am wrong. That's ok. I've been around aviation a long time and think what you want, but aviation is that simple. 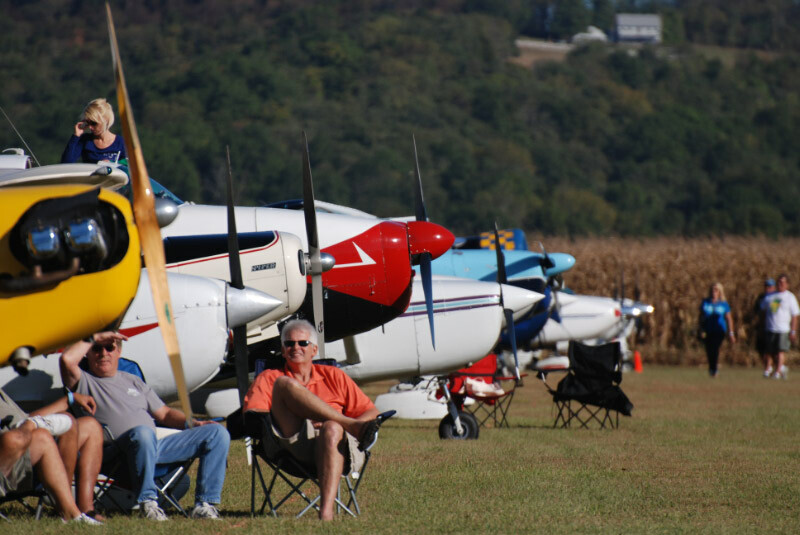 If you love real grass roots flying and people, you'll love it here. If you would bypass 400 planes on a grass field, and the 1500 people on hand, to see five P-51's sitting on a ramp or twenty military planes do fly-bys, well then you likely will not like it here that much. Yet, we certainly do extend the offer in hopes you find a family you never knew you had. It's just that I don't think it's in any way a shame or that it sullies "pure" aviation for there to be people with different or, like me, changing views toward aviation. There is no "correct" view, only individual perspectives, and ones that change over time as our lives and circumstances do. Once my "family" hung out at the O-club, now it's more apt to be at your grass strip, but I wouldn't disown either! I'm not smarter or more enlightened now, just different. It's like cars. Some see them as tools, others as objects of passion. One group goes to fleet managers conferences, and other to Pebble Beach concourses. To one an efficient point-to-point freeway is a thing of beauty, while the other thinks narrow winding roads are the only "real" way to go. Each thinks the other is off the mark, yet both are right from their own perspective.